A dataset is a range of contiguous cells on an Excel worksheet containing data to analyze. Title to clearly describe the data. If you do not specify a title, the cell range of the dataset (such as A3:C13) is used to refer to the dataset. A header row containing variable labels. Each variable name should be unique. Units of measurement can be included in the label by enclosing them in brackets after the name. Rows containing the data for each case. The number of rows is only limited by Excel (currently over one million). Columns containing the data for each variable. Optional: Labels in the first column to provide a meaningful name/identifier for each case. When you use an Analyse-it command, the extent of a dataset is determined by scanning outwards from the active cell to include all surrounding contiguous cells. The extent is known when a blank row or column surrounding the dataset, or the edge of the worksheet, is reached. 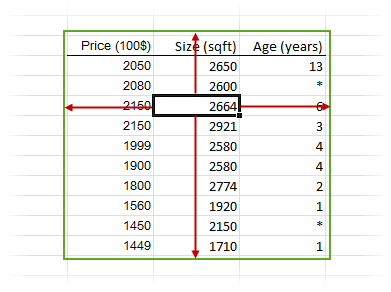 Most Excel commands (for example, Sort, Pivot Table) use the same technique to determine the range of cells to operate on. It avoids the need to select often-large ranges of cells using the mouse, which is laborious and error-prone. It also ensures that if you add, or remove, cases or variables, that subsequent analyses automatically reflect any changes to the dataset. When you analyze data, any data in hidden rows on the worksheet are excluded. This feature lets you easily limit analysis to a subset of the cases in the dataset. 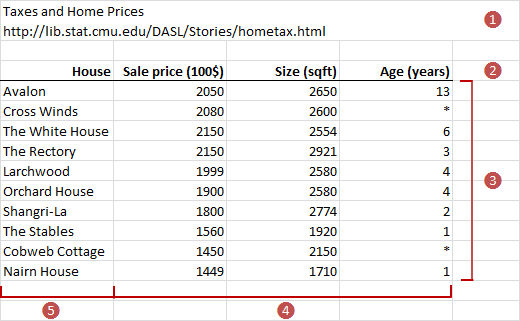 You can hide rows manually or use a filter to hide them based on criteria. You can locate a dataset anywhere on a worksheet, and you can keep multiple datasets on a single worksheet provided you separate them from each other by at least one blank row and column. However, we recommend that you use a separate worksheet for each dataset. Using separate worksheets allows you to name datasets using the Excel worksheet tabs, navigate between datasets using the worksheet tabs, and ensures that filtering a dataset does not affect other datasets on the same worksheet.